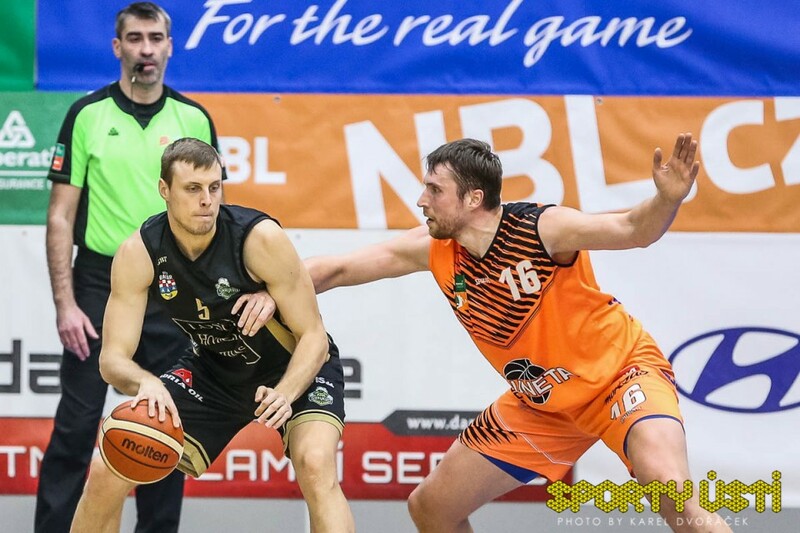 Sluneta Usti nad Labem defended homecourt in their first quarterfinal against BC Adriaoil Skrljevo with a tight 90:89-victory . But after a great finish, the Croatians have all chances in the second leg. Referees: Jerab, Vondracek, Kec (all CZE). Venue: SPORTCENTRUM, Usti nad Labem (CZE). Scorers Sluneta Usti nad labem: Pecka 24, Martin 20, Wisseh 10, Šmíd and Wallace both 9, Houška 7, Šteffel 5, Svejcar 4, Fait 2. Scorers KK Skrljevo: Uljarevic 26, Bamjak 22, Krstanovi 12, Yacoubou 11, Usic 8, Williams 6, Sarac 4. For the first time SLUNETA made it to the play-offs in an European cup, in the quarterfinals SLUNETA met the team from Croatia – KK Skrljevo. Guests came to Ústí already a day before the game and had enough time to prepare for the game. And the beginning showed it. First quarter was more about the offence than the defense. At the end of the first ten minutes the guest were up by 7. The second quarter was similar to the first one, a lot of tough duels under both baskets, but with good news for SLUNETA, the home team was able to cut of some point from the point difference, half-time score was 40:43. Even the third quarter did not bring any answers about how is going to win the game. So everything important happened in the last ten minutes. SLUNETA started the fourth quarter with a 5:0-run and were up 74:65. Guests seemed that time little confused, and we used the chance to get ahead even more. When Pecka dunked with two minutes left, SLUNETA was ahead 90:76 and everything looked like it will be another easy win. But Skrljevo showed a very nice effort by put our players under pressure. That time SLUNETA was not able to cross the halfcourt. Point by point guest cut of every single point of the point difference, but at the end the home players were luckier to get the win 90:89. But the guests have fought till the end and the reward was a 13-0 run and only one point difference to second game in Croatia. Damir Rajkovič, head coach of Skrljevo: Congratulations to the opponent, we had a good first half, but in the third quarter we had big problems in the defense, so we became 29 point. Then we started to play more aggressive and we could even win. I thing the game in Skrljevo is going to be a very good game between two excellent teams. Antonín Pištěcký , head coach of Sluneta: We decided to play AAC for two reasons. First, we wanted to play more games, second we wanted to meet different types of basketball. And that was the case today, in the first half we met a defense, which we are not used to from our league. The opponent played a very good defense and we did not know what to do. In the third quarter we finally were able to deal with that and we played a very good quarter. But the score is as it is because we allowed Skrljevo to make13:0-run, they had 4 fouls, so it was even harder, but we made some stupid decisions and turnovers. We became 23 points after turnovers… but still, I am very thankful for todays experience, it was a great game and we are looking forward to the game in Croatia. Everything is open. Josip Barnjak, player of Skrljevo: Congrats to the winner team and I am proud of my team, we were down by 14 but we came back and we have o good chance to play a great game at home. We played a good defence and that is what we have to do, because we are young and that has to be our game. Justin Martin, player of Sluneta: It was a great game from start to finish. Coach prepared us very well for the game. We played 3 quarters good, but at the end we had a mental breakdown and gave up a 14 point lead. We have to focus on the next opponent and look forward to go to their place and have another great game.